You guys! To say I'm excited about today's Christmas Gift-Away is a MAJOR understatement. You see, my fabulous friends at Bevilles have given me some incredible prizes to give away to you, my lovely SIL readers! I am definitely a jewelry girl - I love diamonds (and can spot a fake in a second! ), love pearls and I love all things pretty. Jesse will tell you I'm attracted to shiny things, much like a bird, and it's probably true. Today, we're giving away these gorgeous 9 Carat White Gold 1 Carat Diamond Stud Earrings. These are a brill cut square stud and let me tell you, these babies shineeeeeeeeeeee! I am so excited that this time next month, I'll be mailing a pair of these earrings to the lucky winner so you can share in the fabulousness. How to enter this gift-away! Step two: Leave a comment on the entry post on Facebook telling us How you are going to make your Christmas fabulous this year! This giveaway will run right through to the new year, so you have plenty of time to enter! 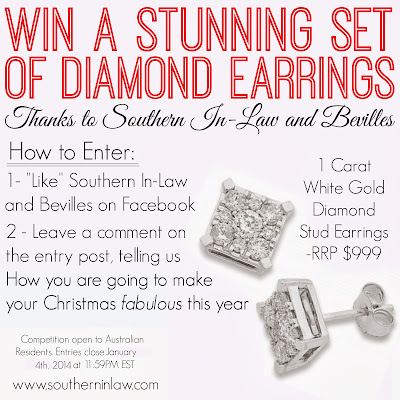 Competition is open to Australian Residents and closes on January 4th, 2014 at 11:59 PM EST. The best valid entry will be selected as the winner by Kristy, Jesse and Westfield and notified via email. Should the winner not reply within 14 days of contact, an alternate winner will be selected. 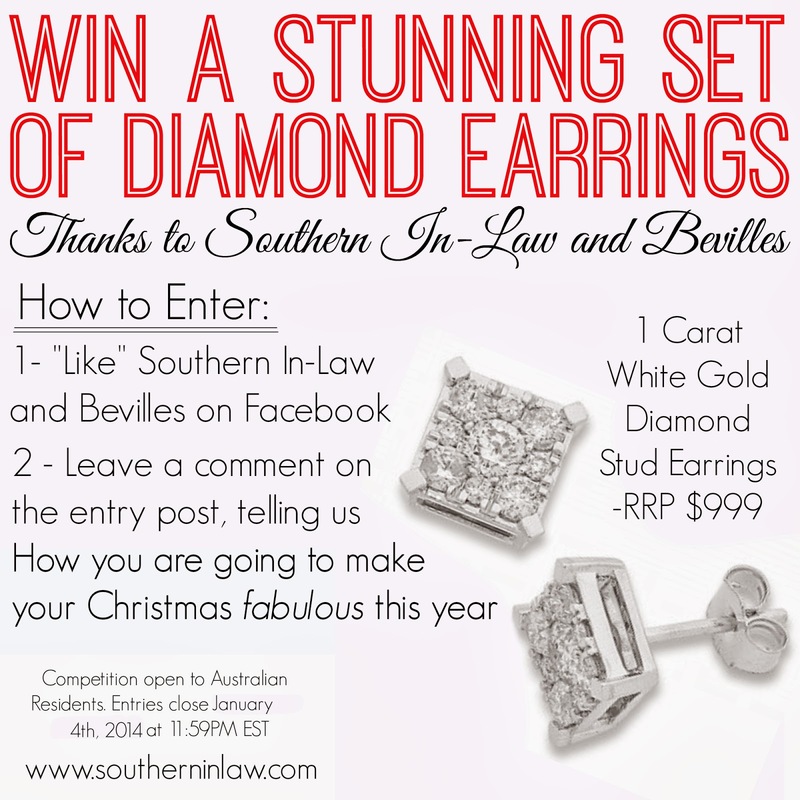 Please note: the winner must be a valid and current liker of the Southern In-Law Facebook and Beville Facebook pages or other relevant social media pages at the time of competition's close. How are people trying to cheat by "liking and unliking"? How would that increase the chance of winning if somethings you're a Liker and sometimes you are not???? Hi there, it doesn't increase the chance of winning at all. Many people don't actually want to "like" the page, simply win the competition so they will like the page and then unlike it a few days later (but still want to win that prize) - we can actually see who does this and who doesn't - as well as how long people have liked the page for. Christmas for me goes until end of January and this year was the best being surrounded by family and friends!!! Christmas is always fabulous because the whole family gets together at the one time, which is hard with everyone working and living all over. im disabled and unemployed so its going to be quite,hopefully i can make my missus,s year one to remember. Christmas this year will be, Fabulous for me, so much love and cheer with friends and family ! What a lovely prize to win. Good luck everyone.Merry Christmas. Would love these. Sooo pretty. Our Christmas was fabulous this year because we simply enjoyed the pleasure of family company and not stressing too much - and gifts too. I will laugh, I will cry, I will feel stressed, I will feel blessed, I will show devotion, I will relax, I will EMBRACE each and every emotion, because the holiday season is only here once a year! Why has Santa got no children? Cos he only comes once a year, and that's down a chimney! Boom, Boom! Our Christmas was fabulous this year as our two little girls have just hit that magical age of belief and wonderment. They were lucky enough to get beautiful presents, and get to play and cuddle with all sorts of family and friends, but some of their (and our) most special moments were discovering the cookie crumbs and spilt milk left by Santa, the overturned reindeer food bowl on the lawn, and the magically sprouted candy canes grown from the seeds (mints) we'd planted on Christmas Eve! Christmas is brought alive by kids isn't it? Perfection. Doing what we always do.... enjoy being together and having a wonderfully rich family time. Kids and I had daily Christmas planning meetings till Christmas day - reduced my stress levels and everyone was super duper happy!! A fantastic day, with a positive attitude, and lots of laughter and fun with my 3 gorgeous sons. Just by keeping it tasteful but simple for less stress and taking the time to enjoy my family, every moment is precious. Instead of worrying my Mum with cooking. We decided to get everyone together, break with tradition and go out to a Chinese restaurant for Chrissy lunch.. not only did I come away feeling healthier with all those crisp vegetables is no one had to do dishes, (not us anyhow) no one needed a nap and the price was no more than a big cook up at home. It was truly a perfect family day with a touch of something different. We'll start the day naughty but nice. Sipping FABULOUS champagne, eating coconut ice. Then the fun begins under the Christmas Tree. Opening presents, my children squealing with glee! My husband always surprises me with something FABULOUS. Designer lingerie or jewellery to make me feel glamorous. Then it's off to my family's home for Christmas dinner. My mum is a FABULOUS cook, her dishes are always a winner. We relax and enjoy food that is simply divine. In decadent surroundings, we indulge in wine. After a FABULOUS day, back home we retreat. With a full belly, oh boy we sure did eat!